From performance, pop poetics, and discursive direction to short films, music videos, site-specific installations, and sculptures (spanning 3D prints, found objects, and ceramics), Judith Hopf maintains a practice of growing diversity. Paired with a tongue-in-cheek attitude and slowed working process—deliberately setting her own minimum quota for creative output to a single film and a series of objects per year—her array of work presents a playful resistance to categorization and requirements of artistic production. Often propelled by her immediate environment, Hopf has repeatedly collaborated with other artists and worked with many non-profit institutions in Berlin. Taking its cue from Hopf’s defiance of conventions and fast turn-overs as well as thriving on her catalogue of collaborations—ongoing and new—Hopf’s Cycle at PRAXES fell in four uneven measures. the human body in historical moments of crisis—are structured as series of sometimes subtle, sometimes confrontational transfers from one work to another, from one context to the next. Following the logic of a rehearsal, that is, testing how various parts of an anticipated activity come together while simultaneously rethinking and rereading their content and position, Pisano’s Cycle at PRAXES developed as a spatial, contextual, as well as collective experiment. With a cannibalistic approach that is very much in line with the artist’s practice, this Cycle conjoined two equally long periods of on-site investiga-tions, entitled Rehearsal I & II, and a longer stretch of simultaneously live and published semi-public/semi-private reflections, entitled Rehearsal III. 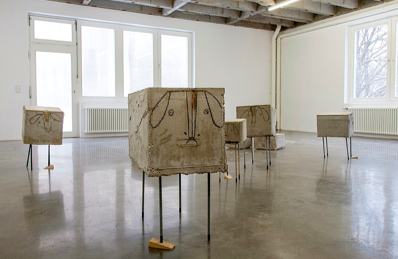 Emphasizing deceleration to the point of deadpan stillness, Hopf’s first exhibition module at PRAXES centered on a flock of concrete sheep from 2013, grazing unimpressed on the (institutional) modernist layout. Pisano’s first presentation at PRAXES, Rehearsal I, Take One: Parts That Do Not Go Together gradually unfolded between parts of works that belong to different systemic presentations within the artist’s oeuvre. 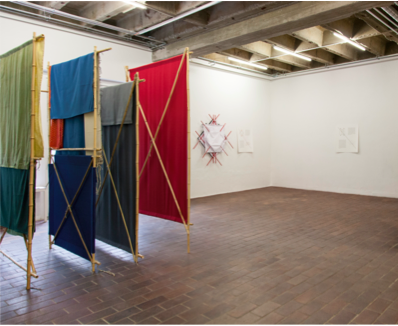 Judith Hopf, installation view at PRAXES. 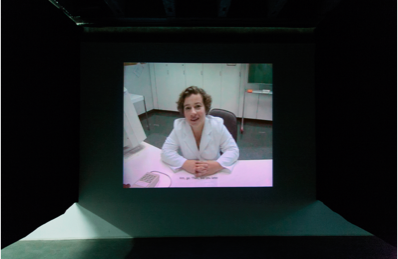 With a rotating sequence and tailored display, Hopf’s second exhibition module at PRAXES shifted into fast-forward, presenting a comprehensive archive of the artist’s film works from the past two decades, captured in a ten-day screening program. Created at the deliberately slow pace of one work a year, Hopf’s film production hints at a long-term engagement with the resilience of humor and points of collective resistance. 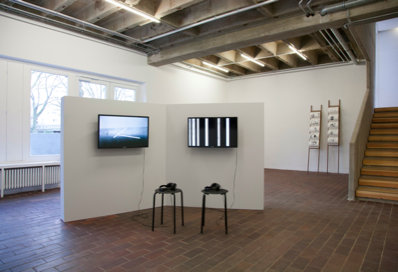 Falke Pisano, installation view at PRAXES. Rehearsal I, Take Two: Parts That Do Not Go Together continued to gradually unfold and amplify cross-readings and slow articulations within the artist’s practice. Where Take One brought together collages and dismembered, fractured bodies of work, the backbone of Take Two was the grand and swirling Structure for Repetition (not Representation). The sculpture of curtains and panels spinned a genealogy as it, in turn, interfered with Pisano’s constructed narratives and blocked the spatial overview of the ground floor at PRAXES. Pisano’s second Rehearsal, subtitled Heart Head Hold-up, opened with a question: What is the relationship between affect and aesthetic knowledge when approaching an object? Chillida (Forms & Feelings), a film from 2006 on display throughout this exhibition chapter, mapped Pisano’s reactions to a series of photographs by David Finn of public works by the Basque sculptor Eduardo Chillida. Its suggestion of subtle links between objects, representation, and personal experience is further emphasized in a continuously changing installation of artworks, events, and support material. Running through the end of this exhibition Cycle, Rehearsal II evolved as a spiral of association and accumulation of curtains, paravants, hooks, screens, words, and works, hidden and emphasized in turn. Judith Hopf’s third exhibition module at PRAXES took a closer look at a series of masks sculpted from hard-drive and smart-phone packaging and recreated as 3D-prints. The functionless, unemotional faces of everyday technology draw out the complicated bond between humans and their tools. For her fourth and final display, Judith Hopf created a brand-new installation responding to the cyclical investigations at PRAXES. As if in evolution or metamorphosis, things emerged and submerged into the polished concrete flooring—or through it entirely. Slowly sinking or about to rise, a landscape of detritus, or objects under construction. Plus to minus, minus to plus, sun up, sun down, (re)cycling. Turning points, how to adapt, how to risk, how to read water levels, interest rates, housing prices, how to reemerge, how to disappear. Hopf has exhibited extensively with recent solo presentations at Studio Voltaire, London (2013), Fondazione Morra Greco, Naples (2013), Malmö Konsthall (2012), and Grazer Kunstverein (2012). Her work was featured in several locations in dOCUMENTA 13 (2012). Born in Karlsruhe, Hopf has lived in Berlin since the early 1990s and holds a professorship at the Städelschule in Frankfurt. Pisano recently had solo exhibitions at The Showroom, London (2013) and De Vleeshal, Middelburg (2012). Her work was included in the Istanbul Biennial (2013), the Shanghai Biennial (2012), and the 53rd Biennale di Venezia (2009). In 2013, she received the Prix de Rome. Originally from the Netherlands, Pisano lives and works in Berlin. In Spring 2014, two external curators were invited to contribute to the process of collectively and critically addressing the featured artistic œuvres. Cecilia Canziani joined PRAXES Directors Rhea Dall and Kristine Siegel in approaching Judith Hopf’s artistic practice. Cecilia Canziani is Co-director of Nomas Foundation, Rome, where she has been invested since 2009 in an ongoing critical analysis, reshuffling, and questioning of emerging artistic practices. Moreover, Canziani is a co-curator of ZegnArt, a contributing editor of the magazine Cura, and a PhD researcher at the Doctoral School of History, Archeology, and Art History at the University of Naples. In Spring 2014, two external curators were invited to contribute to the process of collectively and critically addressing the featured artistic œuvres alongside PRAXES Directors Rhea Dall and Kristine Siegel. Elena Tzotzi partook in curating the Cycle of Falke Pisano. Elena Tzotzi is the Co-director of Signal Center for Contemporary Art in Malmö, Sweden, a collaborative exhibition venue, committed to producing, presenting, and contextualizing art. 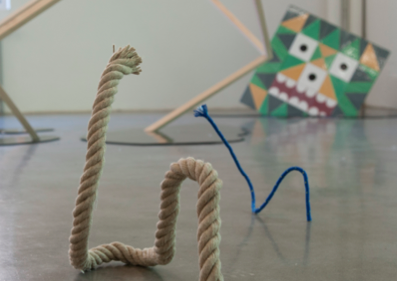 Previously, Tzotzi worked at the Rooseum Center for Contemporary Art and Lunds Konsthall. She has curated numerous exhibitions as a freelance curator and contributes regularly to publications and magazines.